Blight can be a big problem for many polytunnel gardeners and can quickly decimate your polytunnel crops of tomatoes and potatoes if you do not act swiftly. Blight is one of the most common problems experienced by new polytunnel gardeners and can be alarming. Being forewarned, however, is being forearmed. By understanding blight, beginners can learn how to minimise the risk and reduce the chances of blight striking, as well as learning how to respond if it does strike. In this guide, we will aim to arm polytunnel gardeners in their fight against tomato blight and potato blight. Blight is a fungal problem and the spores can linger for years, causing perpetual problems.There are two types of blight, early blight, that comes early in the season, and late blight, usually a much more destructive form, which comes in late July and August. Early blight is not a common problem in UK gardens and those that believe they have it are usually looking at a case of magnesium deficiency. 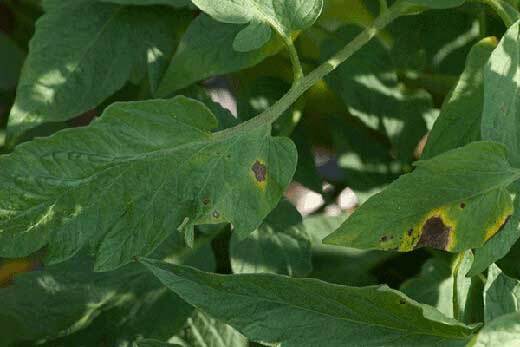 In this guide, we are talking about late blight, which is also colloquially referred to as tomato blight or potato blight. Late blight is caused by the fungus-like organism, Phytophthora infestans. This is an extremely common problem in UK gardens, especially during wet years. 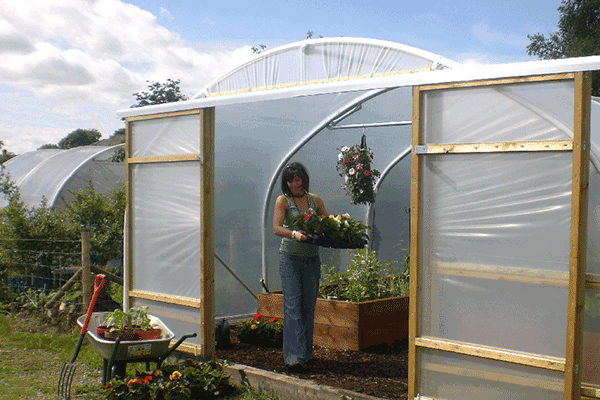 While growing tomatoes and potatoes in a polytunnel can reduce the likelihood of blight developing, it is still relatively common to experience an outbreak when growing under cover. 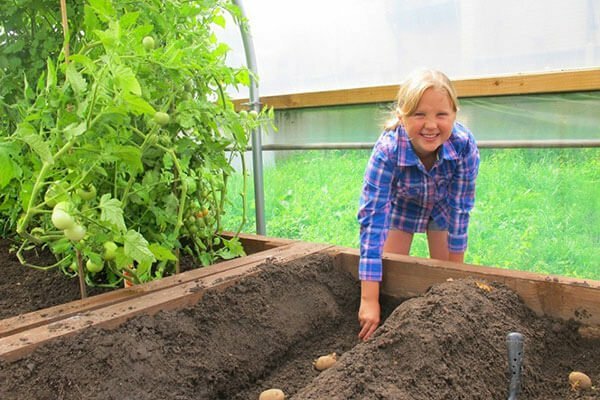 This is because the organisms thrive in damp, soggy conditions, which can prevail during a wet summer outdoors but which can be somewhat controlled undercover in a polytunnel. What Does Tomato Blight Look Like? What Does Potato Blight Look Like? Blight looks much the same as tomato blight on leaves and stems. If left unchecked, the disease can spread to potato tubers. Affected tubers will have a red-brown decay below the skin, and will develop a soft rot. Blight in tubers may not be immediately obvious upon harvest, but affected tubers will rot in storage. Check stored potatoes and growing potatoes regularly for signs of any problems. Blight can really decimate your tomato crop and polytunnel grown tomatoes and potatoes can be particularly prone to this pesky problem. Keeping on top of cleanliness and order in your indoor growing space will help to minimise blight problems, as will removing any plants that are suffering immediately and disposing of the material to prevent the spread. You cannot entirely escape the risk in the wet British summer but you can reduce the chances of losing your whole crop. Open the doors on hot days, employ adequate shading and try not to overplant as this can reduce air flow. Even when it is grey and dull, you will usually still have to leave doors open for ventilation at this time of year. When you water your tomato and potato plants, try to make sure that you water close to the soil and roots, where the water is needed, rather than getting the leaves all wet. When leaves are wet, blight is more likely to take hold. Water will usually splash a little and it is difficult to avoid wetting foliage entirely. To minimise the risk of the leaves staying wet overnight, you should do your watering in the morning if possible, to allow things to dry out before the temperatures drop at night. 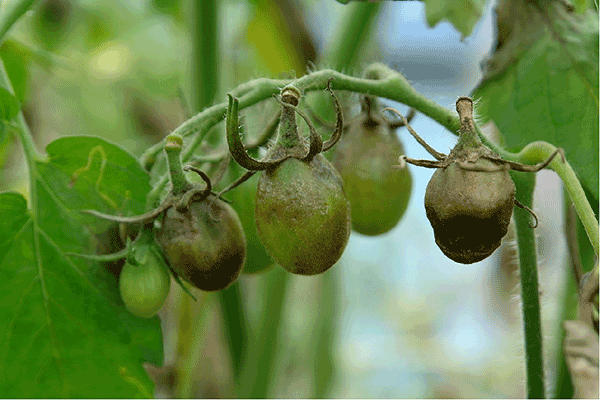 It is important to feed tomato plants in order to get good fruits. You should always feed with a high potassium feed, not a high nitrogen one because a high nitrogen one will encourage leafy growth at the expense of the fruit and leafy tomato plants are more susceptible to blight. 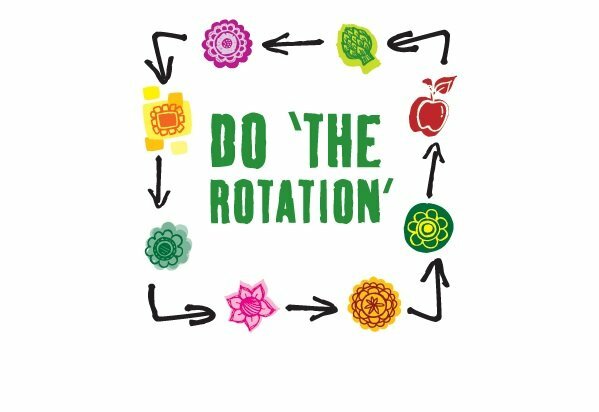 It is also important not to grow tomatoes or potatoes in the same area year after year but to practice a good system of crop rotation. Since blight spores, like other fungal diseases, can stick around in the soil, growing tomatoes and potatoes in the same place for subsequent years can make it more likely for the problem to recur. Ideally, you should have a four-year rotation in place. Note that since these are F1 hybrid seeds, you cannot collect and plant the seeds for the following year. So for the most sustainable practice, it is still usually better to choose heritage varieties. Though none have perfect blight resistance and even with these more resistant options, blight can still strike. Some old favourites amongst potato varieties are particularly susceptible to blight. These include King Edwards, Arran Pilot, Majestic and Sharpe’s Express. These are best avoided in locations with a particularly bad blight problem. With potatoes, growing only first early crops will reduce the risk of blight in potato crops, which tends to only appear later in the year. Whisk first earlies out of the polytunnel by early July and you will likely not have to contend with blight in your potato crop. While this will not prevent blight from taking hold in maincrop potatoes, you can provide a certain level of protection to the tubers that are the edible part of the plant by earthing up, of adding thick organic mulch around your potato plants. Remain vigilant as the year moves from summer into autumn and, should you be unlucky enough to have a problem with blight, act quickly. If you do this you should be able to avoid a complete disaster. Keeping on top of cleanliness and order in your indoor growing space will help to minimise blight problems. If you notice that you have some blight, remove any plants that are suffering immediately and dispose of the material to prevent the spread. Take care with material for disposal and make sure none of it makes its way to your compost heap. If you keep potato tubers healthy, even if blight takes hold of the leaves you can often still save the harvest. When about 25 % of leaves on potato plants are affected, or marks can be seen on the stems, cut off the stalks of the plant near ground level and be sure to rake up and remove all the debris. The skins on the tubers will be hard after about two weeks, at which point they can be dug up and moved into storage or eaten. As a novice gardener, you may be frightened at the prospect of losing an entire crop. But gardening always comes with ups and downs and it is important to remember that even if you do get blight, or any other disease, in your polytunnel, you will still be able to harvest other crops. And even if you have a bit of a bad time of things – there is always next year. Have you had problems with blight this year? Let us know how you have got on in the comments below. The Blightwatch website is FREE to sign up for Smith Period warnings that are now calculated based on data from the entire UK at postcode level. Once you register you can request warnings, either by email or text to your mobile phone of Smith Periods in up to 10 postcodes near your garden or allotment.